Holy Week is upon us, and tomorrow is Palm Sunday. In conversing with some others in casual conversation this morning, we lamented that our church doesn't make as much of Holy Week as the more liturgical churches, be they Lutheran, Anglican, Orthodox or Catholic. We miss it. Focusing on the last week of our Lord's life feeds the soul with the truth of what our salvation cost, and draws us into deeper fellowship with Him. I was doing some bush whacking behind our home this afternoon and came upon a really prickly vine. I cut a sizeable portion of it, and gave it to my sister, who is making it into a "crown of thorns" to remind us of the mockery and scorn our Lord suffered just before the Cross. I'm not sure how well this homemade "crown" will turn out, but it seems to be coming along well even as I write. Lent begins today, or, in the case of the Eastern Catholic churches, it has already begun on Monday. Here are a couple of simple practices that have in past years helped our children get into the spirit of Lent and prepare for the joy and new life of Easter. 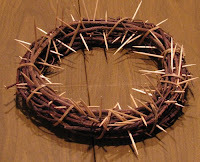 The "crown of thorns" has been a big hit at our house. I've seen directions for making salt-dough crowns, but ours is simpler. I simply purchased at the craft store an 8" wreath made of woven twigs. On Ash Wednesday, we stick toothpicks into it to represent thorns, and place the wreath in the center of our dining table. The children get to remove one thorn for each sacrifice or act of kindness (you can make it as specific or general as you like) and their goal is to remove them all before Easter. Some years, we have cleared them all in plenty of time. In this case, we add little flowers to the wreath instead of removing thorns. The flowery wreath makes a good Easter centerpiece. Me: I find her practice quite creative. May Holy Week this year find us all more reflective, grateful, and worshipful than ever before. VIDEO FROM GOSPEL COALITION CONFERENCE: PANEL ON "WHAT I'VE LEARNED FROM YEARS OF PREACHING CHRIST FROM THE OLD TESTAMENT"
The discussion began with how each person came to be convinced of a Christ-centered preaching model of the Old Testament. There we discussed how each pastor came to the personal conviction that Christ should preached from all of Scripture. Next, we covered more esoteric topics like how do preachers preserve the moral sense of Scripture without abandoning the gospel–or, the question that makes every young preacher’s knees knock–how do we preach Christ from the Song of Solomon? Sam Logan, Preacher and Preaching: Reviving the Art in the Twentieth Century (P&R) – Ryken mentioned specifically Edmund Clowney’s article. Another videotaped panel discussion available for viewing is "Getting to Know the Gospel Personally as One Grand Narrative" featuring Kent Hughes, David Jackman, and Ligon Duncan. Me: I've discovered more resources here. ← What’s a “Gemini” to Do? At The Gospel Coalition national conference, BibleMesh was able to conduct three panel discussions. This is the first of the three, entitled ““What I’ve Learned from Years of Preaching Christ from the Old Testament,” in which I (Owen Strachan) asked three veteran preachers, Alistair Begg, Mark Dever, and Philip Ryken, what they have learned after years of preaching Christ in the Old Testament. "BLESSED ARE THE POOR IN SPIRIT... BLESSED ARE THE MEEK" - OH YEAH? "The Beatitudes reveal that what succeeds in the kingdom of heaven also benefits us most in this life here and now. It has taken me many years to recognize this fact, and only now am I beginning to understand the Beatitudes. They still jar me every time I read them, but they jar me because I recognize in them a richness that unmaskes my own poverty. Blessed are the poor in spirit . . . Blessed are the meek. A book like Paul Johnson's Intellectuals sets out in convincing detail what all of us know to be true: the people we laud, strive to emulate, and feature on the covers of popular magazines are not the fulfilled, happy, blanced persons we might imagine. Although Johnson's subjects (Ernest Hemingway, Bertrand Russell, Jean-Paul Sartre, Edmund Wilson, Bertolt Brecht, et al.) would be judged successful by any modern standard, it would be difficult to assemble a more miserable, egomaniacal, abusive company. The following comes courtesy of Wintery Knight blog. He spotlights a recent apologetics conference held at Rick Warren's Saddleback Church. For a video and audio of the following lectures, click here.